Starting September 11th 306 Underground Worship. This will be a worship experience designed specifically for teens. The year round, weekly event will also include fun games, breakfast treats, and small group sessions every week. Room opens at 9:30 for breakfast. The FCC Youth Group ministry provides a spot for 6th-12th grade students to hang out, have fun, form meaningful relationships, sing some great music, and learn the scriptures, while developing their own authentic faith. As a team of student leaders, our goal is to create a safe environment that incites wonder, provokes discovery, and fuels passion in the hearts of all of our students. How do I know what's going on? We feel that the absolute best, most effective strategy is to COMBINE the influences of the church and family, in order to make a greater impact on each student. One of the simplest ways for a parent to get involved is to join our email list. This gives you a glimpse into our Sunday School and Wednesday night lessons so that you can join in and continue the discussion at home. Also, you will get regular updates on activities and events. Just send John an email to get added to the group! Another resource for parents and students is to be added to our FCC Youth Facebook page. There you will find brief updates and reminders before youth events and activities - as well as photos from outings! Our Sunday hour is a relaxed small-group discussion as we sip our coffee. Sunday School is every Sunday morning beginning @ 10am. 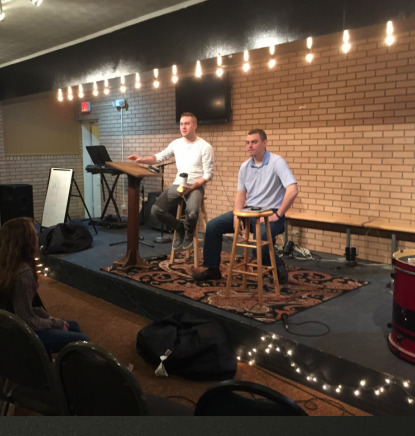 If you would like more information about our youth group, click here to contact Jeremy Westbrook, our Student Minister. If you need to add or update registration information for your student, please download our registration/health form and drop it by the church office.